As Beebe Healthcare celebrates its 100th anniversary this year, Lewes native Robert Wingo can’t help but reflect upon the mark his mother made on Beebe history, as well as on the history of the African American community in Lewes. His mother Elsie Dunning Wingo died November 25, 2014, when she was 92 years old, yet her legacy lives on. In 1964, when Elsie was 43 years old, she became the first African American nurse to work at Beebe Hospital. Robert was just nine years old then, but still feels the overwhelming sense of pride at seeing his mother attain a status that no other African American around him had attained. He remembers the nurse’s pin that she earned, and the white uniform, stockings and cap that she wore. “I was so proud. She inspired me to work hard to reach my dreams,” he said, remembering that her dream was to become a nurse. Elsie had worked in the laundry department at Beebe with Robert’s grandfather Dewey Dunning. In the ‘50s, she had worked as a domestic, and sometimes helped out with her father’s catering business, too. She was in her early 40s when she finally earned her high school diploma, after returning to school. She soon earned an LPN certificate, enabling her to be promoted to caring for patients at Beebe Hospital. “We didn’t have the opportunities that people of color have now. It was a time when you had limited opportunities due to your race. We were segregated and there was so much we couldn’t do, places we couldn’t go. And then we saw Cousin Elsie become a nurse at Beebe. She inspired all of us” recalls Stell Parker-Selby. Stell Parker-Selby, herself, went on to become a teacher and the first African American woman administrator in the Cape Henlopen School District. She continues to serve on many boards, including the Milton Town Council, and recently retired from her position on the Beebe Healthcare Board of Directors. “Elsie was a Dunning and they were a caring and hard-working family. They were always doing good things for the kids in the neighborhood” recalls Stell Parker-Selby. Robert Wingo, born at Beebe Hospital in 1955, remembers his mother as a woman who worked hard and who had a heart of gold, thinking of others until the end of her life. Neighbors, friends and family members told him stories about her from before he was born; the rest he observed and experienced. Elsie was born in Lewes in 1921. She was the oldest of 14 children, though three of them died soon after they were born. She was an avid reader growing up and believed in education. She attended the Delaware High School for African Americans at the Delaware State College campus in Dover, staying there for the week and coming home on the weekends. “My grandfather drove her back and forth to Dover in one of the Beebe doctors’ cars,” Robert said. But, she had to give up high school before she finished because she was needed at home to work and help with her younger brothers and sisters. The Dunning family lived next door to the Happy Day Club at West Fourth Street and Dupont Avenue. It was a popular nightspot in the African American community in the ‘40s, ‘50s, and ‘60s that was on the Chitlin’ Circuit and attracted many famous entertainers. People went there to dance to jazz bands and to relax. It was at the Club that Elsie met her future husband, Pearl Edward. The U.S. Army had brought him from Ohio. Robert recalls that Pearl Edward was stationed at barracks at Redden Forest. The two married in 1942 and had three children. Elsie also continued to work as a domestic. In 1962, she began her daily travels to William C. Jason Comprehensive High School in Georgetown, Sussex County’s segregated high school. Pearl Edward died in 1964, not long after Elsie had become a nurse. Dr. Anis Saliba, a physician board certified in general surgery, thoracic surgery and surgical critical care, arrived in Lewes in 1967 and soon met Elsie. “She became one of my best friends,” he recently recalled, pointing out her professionalism and loyalty to her patients and to Beebe. Dr. Saliba, a member of the Beebe Board of Directors, practiced until 2003, and often cared for Elsie and her family. Elsie left Beebe in 1968 to be a nurse at Dover Air Force Base, driving a long, two-lane road to and from work each day. Once she retired, she continued to be an active person in the Lewes community. At St. Paul’s United Methodist Church in Lewes, she was a lay reader, sang in the choir and served as treasurer. She worked in home health. She took care of local children, later becoming a foster parent to children that had nowhere else to go. Elsie’s work ethic and commitment to helping others inspired Robert, who earned his bachelor’s degree in behavioral sciences from Wilmington College. He worked for many years in mental health, including more than 20 years with the State Division of Family Services, retiring in 2015. 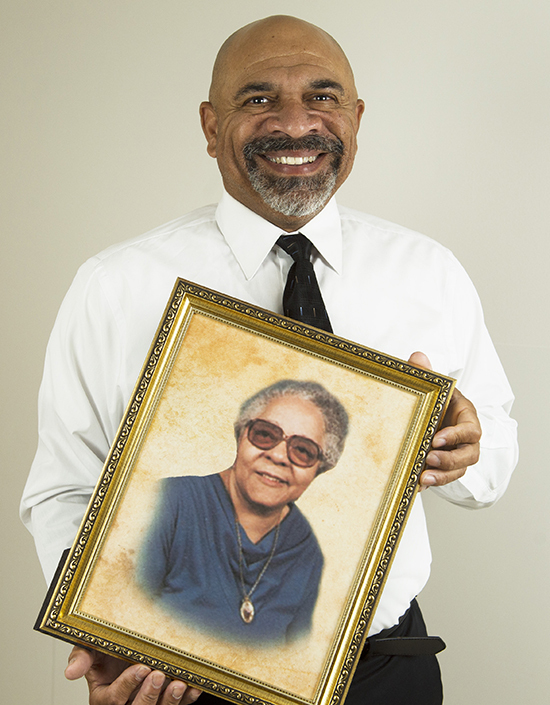 Shown is Robert Wingo holding a portrait of his mother Elsie Wingo, the first African American nurse at Beebe Hospital.